Welcome to Aloha Active Noosa! 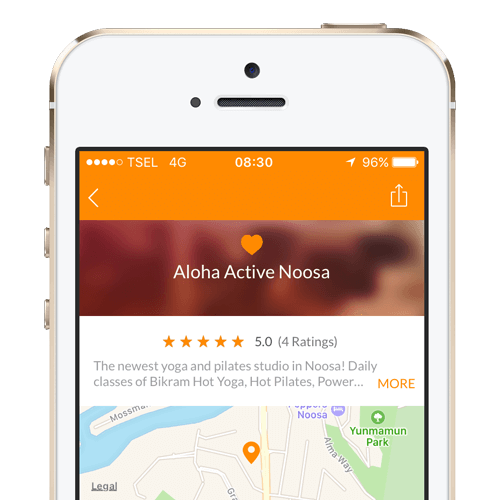 Aloha Active is Noosa’s newest Yoga, Pilates and Massage centre located in the beautiful Noosa Blue Resort. Classes offered include Bikram Hot Yoga, Inferno Hot Pilates (HIIT), Power Yoga, Vinyasa Flow, Aloha Fusion, Yin Yoga and Ajna Light Meditation. All classes are beginner friendly. Creche is available Monday to Friday for morning, afternoon and evening classes (excluding 6am classes). Visit the Creche page for more information. Includes mat and towel hire. Valid 10 days. One time offer available to Sunshine Coast residents only. Our yoga and pilates classes are for EVERYBODY, regardless of age, body shape or state of health. Both HOT yoga and pilates and room temperature classes offered. Daily yoga and pilates classes run in our two state-of-the art studios at Noosa Blue Resort. View the full class timetable now. Aloha Active has two private massage rooms adjacent to the yoga and pilates studio. Range of massage treatments available, read more or call to make an appointment. We run organised group retreats in Bali and Noosa as well as offering special holiday packages to DIY a Yoga Retreat in Noosa. Use the app for class times and to buy passes online. Aloha encompasses much more than a mere greeting. It’s true meaning is that of a presence of breath, our very life force. To say aloha is a way of sending and receiving positive energy, a way of living and treating each other with love, respect and understanding. Join our mailing list to receive the latest news and updates from Aloha Active Noosa.